During the Rugged Maniac obstacle course run. 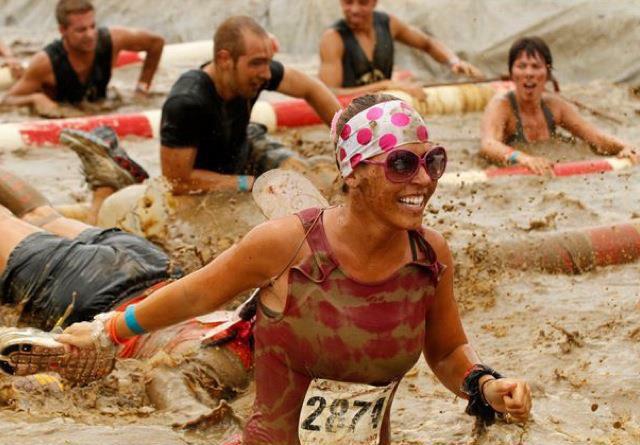 The more mud, the better! Pasta before, gu and salt during and Mozzarella sticks after! Chelsea Handler is a good break from the stressful world that we live in. She cracks me up. Running is very freeing. You are responsible for your own accomplishments and failures. The best days consist of an open road and strong legs to take you anywhere. There is no better feeling than a runners high. Also, you don’t feel as guilty eating that extra slice of desert after a long morning run. This past June I completed my first Ultramarathon. 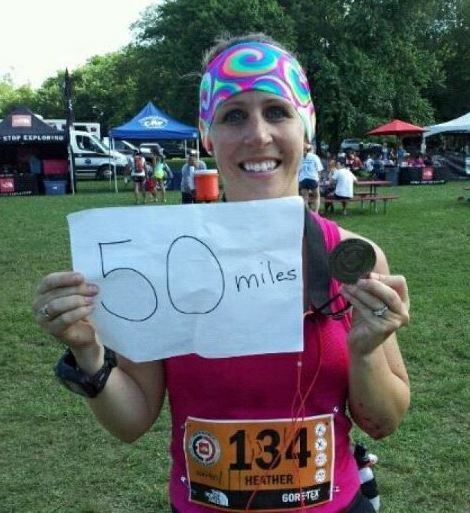 I ran the Gore-Tex 50 Miler through the Northface Endurance Challenge in DC. It was the most challenging yet rewarding experiences of my life. It was incredible to see how strong and powerful your body can be when you push it to the limits. When I crossed the finish line, I was filled with emotions and it was one of the most memorable moments I have had during my running career. For new runners it can be difficult to stay at a consistent speed. The first marathon I ever ran, I burnt myself out and was hurting for the last 10 miles. 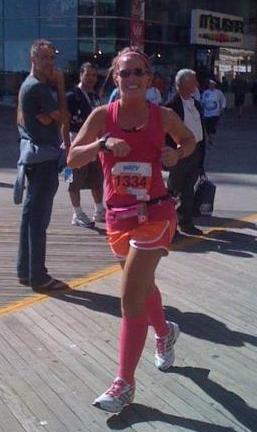 I love helping runners reach their goal time or finish their first race. I have met great people while pacing and we always have fun while we are out there. Isn’t that why we run, to have fun? I know for many people running a marathon is a one time goal that they have spent many months training for and if I can help make that memory a positive one than I am honored. It does not matter if you are the first place runner or the last, you still just ran 26.2 miles and that is awesome! During the New Jersey Marathon in May, we started with a large group of runners, and at the end we only crossed the line with a few. I was discouraged that we lost so many runners until several of them came up to me at the end and told me that they had finished ahead of us and had beaten their intended time. They were so thankful that I was able to pace them properly throughout the race that they had extra energy to get them through the race faster than they expected. Giving hugs and taking pictures with your pace group is such a reward because you truly become a family while you are pushing through the pain and roadblocks to reach that finish line. I promise that we will have fun! Running is a tough sport and I will do all the hard work setting the pace. The only thing my pace crew needs to do is follow along and enjoy themselves. We will talk, laugh and encourage each other. I promise I will do everything in my power to get you across that finish line. Trust your training! You worked hard for this and now it is your time to shine. Drink water, eat salty foods and be aware of what your body needs. Practice every detail of your run so nothing is a surprise. Take your energy supplements during training runs to assure they agree with you and run in the outfit you will wear on race day. And use lots of Vaseline! Most importantly, RELAX! When you are running, remember why you are out there. Running can turn into a mind game and you need to be strong or it can defeat you. Positive affirmations are important to keep you motivated through the tough times. You can do it, don’t forget that at mile 18! I love to visualize my runs. I go through each step of the race from start to finish. Seeing myself running a successful race is encouraging and helps me relax. Not every run will be a positive experience but no one ever regretted the days they went for a run, they regretted the days they didn’t.